Gail & Jane told us this is the 5th Anniversary of Urban Sketchers Seattle! Jane brought some special beverages so we could have a toast. Thanks to Gabi who started it all (on left in red jacket)! 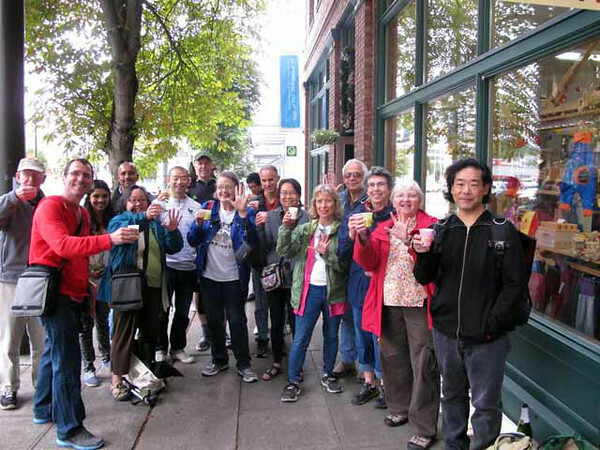 Congratulations to Seattle Urban Sketchers and thanks Gabi for getting the whole ball rolling!! Congrats to all of us, and thank you to Gabi and all the organizers for making each gathering so much fun! I'm so bummed that I had to miss this celebration outing! Ditto David and Tina. So sorry I had to miss this!